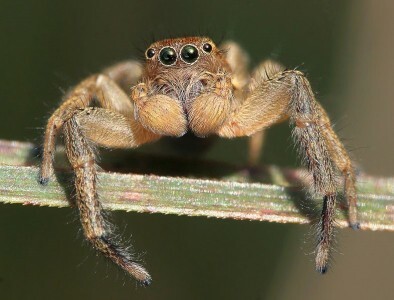 There are over 5000 species of jumping spider – this makes them the most numerous of species in the spider family. They can be found all over the world and thrive in various types of habitat, from mountainous regions to deserts. They do not catch their prey using webs like many spiders – but instead ambush them by leaping on top of them. They have 4 pairs of eyes which allows them to focus on insects from about 20cm away – this way they can distinguish between prey and danger. The hair on their legs helps them walk across very smooth surfaces like glass more easily. They can jump about 50 times their body length!